The Libyan capital, Tripoli, enjoyed a flurry of the white stuff overnight, but in Malta the Met Office yesterday dampened reports that it could also snow here. 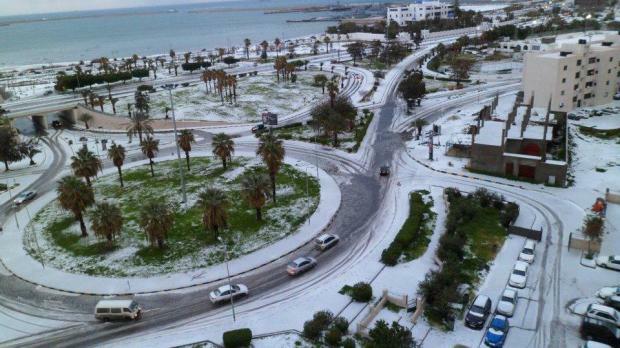 Snow is rare, but not unheard of in the Libyan capital. An Italian website yesterday raised the possibility of snow falling over Malta as extreme cold weather over Europe heads south. .
Rome has been covered in a blanket of whiteness – the heaviest snowfall the city has seen since 1986… but the prospect remains so close, and yet, so far. The Mediterranean islands of Lampedusa, Pantelleria, Malta – and even Tunisia – were forecast to welcome snow, according to Italian weather website Cosmo-Me, with the possibility of temperatures dipping drastically and uncharacteristically to -4°C… at 5,000 feet above sea level. If Malta had a mountain and no sea, it would experience snow, but its highest peak stands at around 850 feet, and its surrounding warm waters, at 15°C, have a moderating effect. The MetOffice clarified that the maximum temperature today and tomorrow is expected to be around 10°C, while the minimum should hover around 6°C. At most, Malta may experience snow flurries on the high areas of Dingli, and Nadur, Gozo. Although the temperature on the ground is a far cry from the sub-zero predictions up above, the forecast still contrasts with the mean maximum temperature for February, which is 15.6°C, and the mean minimum temperature at 9.4°C. “The weather for the coming two days is expected to be partly to rather cloudy, with isolated showers, possibly thundery. The northwest wind will increase to very strong today and decrease gradually to rather strong by the end of tomorrow,” the Met. Office spokesman said. Due to the strong winds, the wind chill factor (defined as the apparent temperature felt on exposed skin due to the combination of air temperature and wind speed) might make it feel colder than it actually is… meaning balaclavas and thick scarves, wound around the mouth, would not necessarily be amiss.